Landmark Bingo is the premier Cozy Games bingo site and the first to launch on the Live Bingo Network, way back in 2009. You may be familiar with other brands on the network, including the likes of Now Bingo and Buttercup Bingo, which are incredibly similar to this site. When you sign up to Landmark Bingo as a new player you will be given a welcome package to get you started. Firstly, once registered just log in and you will be able to play free games for 7 days with no deposit required. This is the perfect way to try out the bingo without having to pay a single penny. If you like what you see, you can go ahead and make your first deposit to receive a massive 300% first deposit bonus. The giveaway to newbies doesn’t stop there at Landmark as you will also receive a 150% and 100% deposit bonus on your 2nd and 3rd deposits respectively. This means newbies will receive in total a week of no deposit bingo games, plus 550% of deposit bonuses. Not bad at all! Play free bingo for 7 days – no deposit required. Make the most of 550% in bonus cash across your first 3 deposits. Compete for progressive bingo jackpots of up to £2,500. Buy one ticket and get one free in Victoria 90. Play for £6,000 in Sliding Jackpots every night. On Landmark Bingo you will receive throughout the month promotions with coupon codes that run across the Live Bingo Network. You will also be able to follow their social media channels to get further exclusive codes. Players are now able to enjoy all the fun of the desktop Landmark Bingo on their mobile and tablet devices. Whether you are on Apple, Samsung or other mobile providers you can play Landmark Bingo on the go by simply opening your mobile device’s browser and entering the URL www.landmarkbingo.com. Once on the site simply log in and away you go. 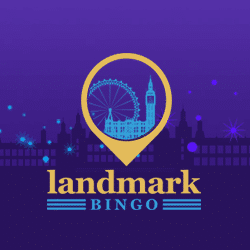 Landmark Bingo is one of the sites that operates using the Cozy Games software – others include Harry’s Bingo and Have A Ball Bingo – so we can be sure that we are going to get a quality service from one of the most trusted operators. On Landmark Bingo, you will find 8 bingo rooms where you will find a wide variety of bingo games to try, including 30-ball, 75-ball, 80-ball and 90 ball bingo. Most rooms on site also over a progressive jackpot and this often is sitting around the £2500 for most rooms. If you prefer slots you will have over 200 slot games to choose from, including some really good ones that appear across the whole network. If Bingo or slots are not your thing, then you will also find a wide selection of top casino and scratch card games for you to play. 7 days completely free bingo no deposit. Large 300% first deposit bonus. Easy to play on mobile, no app download needed. Good selection of bingo games available, with tickets starting from 1p. Landmark Bingo allows you to deposit using all major credit and debit cards, as well as other methods such as Neteller and Paysafe Card. Welcome bonus has 4x bingo wagering requirements. Minimum withdrawal is £1, Minimum deposit is £10. Social media profiles: Facebook, Google+, Twitter. Overall, Landmark Bingo is a decent bingo site that can be trusted to provide you with an enjoyable gaming experience. You will be able to play most forms of bingo on the site and the prizes on offer are not too bad. However, there are just a couple of negatives that mean that Landmark doesn’t get top marks, but it's definitely still worth registering and checking the site out for yourself with 7 days of no deposit bingo games.